Of all the comfort issues facing a passagemaking vessel – power or sail – how it deals with headseas has the biggest impact on crew comfort. This also is a major influence on cruising plans. We know from experience having spent 75% of the distance between Fiji, California, and Alaska on the wind. If you cruise on the West Coast of the US, between Panama and Alaska, you are guaranteed to have half – and sometimes more – of all your passages dead upwind. A lot of the time the breeze will be above 20 knots and sea-state in the eight to 12-foot (2.4 to 3.6m) range. This is also true of heading from Panama to the West Indies, a good chunk of the passages between the East Coast and the Caribbean, and going or coming to or from Bermuda. 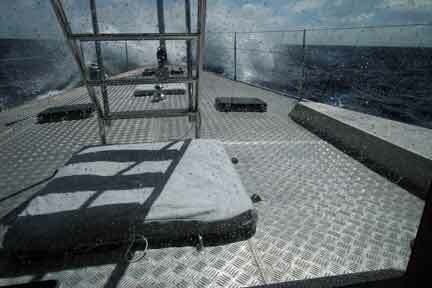 You will even find headwinds on your passages between New Zealand and the tropics – in both directions. Our objective in this design is to have maximum flexibility in picking destinations. We’re spoiled in terms of comfort, and we want to stay that way. 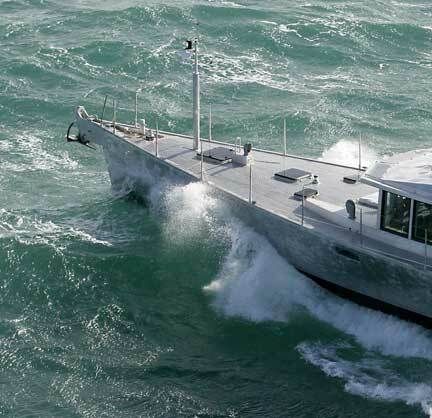 This necessitates a hull shape which above all is comfortable at speed when heading uphill. Before we get into the details of how we achieve this a few sets of photos will show you our objective. The following series were shot between Fanning Island and Hawaii. 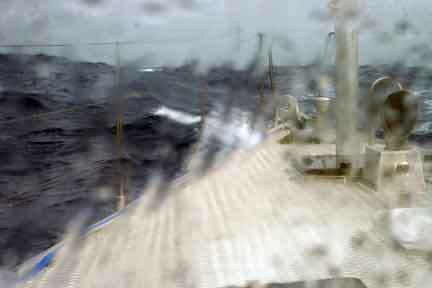 These were taken in in eight to 12 foot (2.4 to 3.6m) waves, almost directly on the bow. Boat speed through the water is 11 knots (speed over ground is 10.5 knots with losses to current). In the first photo we are just starting to enter a wave with the bow. The bow is now about half way into the wave itself. The spray you see is from the anchor hitting the wave. The bow is sharp enough that it makes very little spray. Keep an eye on how much the bow has pitched up. One second later and there is a little more fuss. The bow has pitched up perhaps one degree – almost nothing. Another second and we’re through the wave. The bow is back to normal trim, and there is a bit of sea water left on deck. If the waves are regular, we can almost always find a speed which reduces impact loads to a minimum. 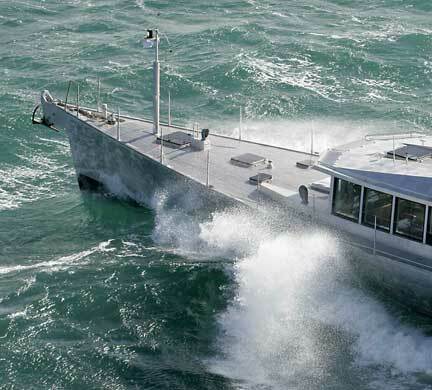 What ends up happening is the hull slices through a majority of the waves and in the saloon, standing watch, or sleeping aft, you barely notice you are at sea. But every few minutes an irregular wave, perhaps a crossing set from a different direction, will upset the rhythm. 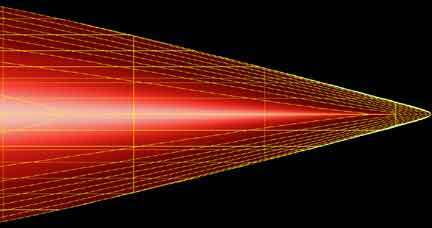 When this occurs we feel a modest jolt. The boat doesn’t mind at all, and rarely does speed drop more than half a knot (if that). This next set of photos were taken leaving Hawaii for California. Winds were in the 25 knot range, on the nose. 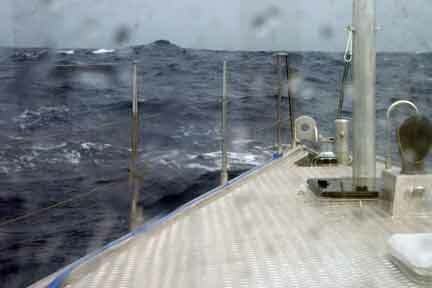 Boat speed is ten knots during this series (9.3 knots over the bottom with current taken into account). The wind chop here is small, not more than eight feet (2.4m). But check out the crest on the left side of the photo. A second later and we’re closer to impacting a wind wave with the background crest appearing to ease off. 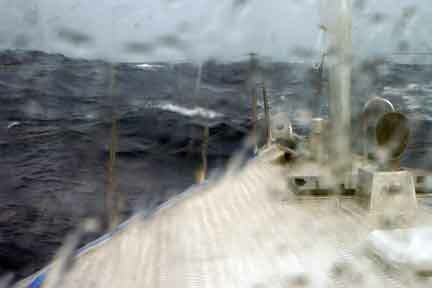 The wind wave is now under the bow, and there is a wave spike just to port of the bow, about 150 feet (40m) ahead of us. No spray, no vertical motion, and no discomfort. But occasionally one of those irregular crests which we saw in the background rears up under the bow. 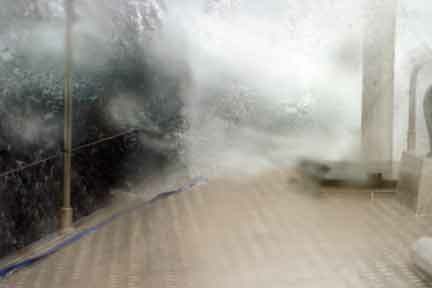 When this happens there is a lot of spray, and a bit of a jolt, but the boat keeps moving at speed. This photo was shot with a telephoto lens, so we could get right into the action. Most of the fuss you see is again from the anchor. But as the wave crest is very steep, and at about 14 feet (4.3m), we’re bound to get a little wet. The next photo in this series has the bow driven well into the crest. What is so interesting about this is that even in this type of wave encounter, there is little change in speed or trim. However, you definitely feel an impact like this. 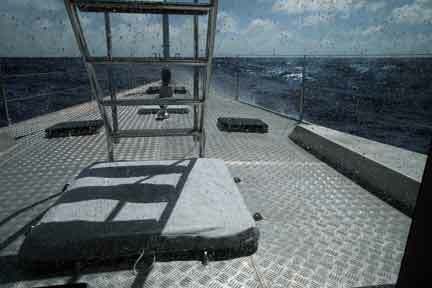 Had we been in these conditions on any of our other designs, we would have just hove to to await a change in the weather. However, in this case, the occasional big impact just tended to keep us alert. We still were able to go about our normal routine, eating, sleeping, reading, and standing watch. In a sailboat you have to consider heel angle, leeway, draft, and stability – not of all of which are favorable towards the desired outcome in terms of pure comfort. But when we remove the necessity for sailing to windward, and for creating stability with the hull as it heels, a whole new range of design options is opened to us. We’ve now got the ability to design a hull shape which will penetrate waves, allowing itself to drive through small to medium size seas, with a smooth motion that reduces drag and pitching while keeping us comfortable. As you read through this section keep in mind that we averaged 10.5 knots with the FPB 83 over the bottom between Fiji and California, against 10 to 25 knots of headwinds, with seas in the four to eight foot (1.2 to 2.4m) size, occasional running 13 feet (4m), often with a crossing swell. This was done, for the most part, in a great deal of comfort. Now, onto the design details which make this possible. When you look at how a hull rides through or over headseas, you have to think in terms of the entire hull – bow, center, and stern. 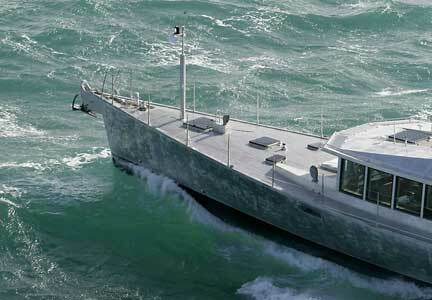 Each part of the hull feels the lift of the wave as it passes and impacts the attitude of the rest of the boat. The bow and stern need to be balanced, so that they work together. A full stern will shove a fine bow down into the oncoming wave, while a full bow will stop the boat cold as the wave impacts it. If the hull is out of balance with the wave energy along its length, a hobby horsing (rocking) motion ensues. Hull and wave drag jump dramatically, fuel burn goes up, and boat speed drops. And it is very uncomfortable. Further complicating the equation is the type of wave trains being encountered. The ocean rarely has a single set of waves. There are usually at least one set of crossing swells and often two or more. This results in a chaotic sea state and no speed – fast or slow – really helps. 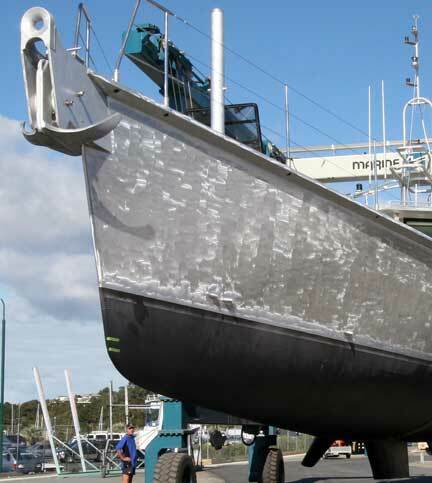 In this situation the hull shape needs to be finely tuned so that it can smoothly negotiate waves of different periods and shapes at a constant speed. Over the last 30 years we’ve spent a lot of time trying to avoid these conditions. We’ve done this by picking our weather and destinations to minimize up wind work. But in spite of it all, we’ve spent more time than we like going against the grain, and avoided some really nice cruising destinations because they were a hard slog to weather. As we said earlier, one of the attractions of the FPB was the ability to make short work of these unpleasant sea states, and do it with a reasonable level of comfort. Now, onto the hull shape which makes this possible. Above is a fish eye view of the hull, looking up at the bottom. This is as close to a knife as you can get in a monohull. The next view (again, above) is of the boat hauled out. Notice that there is very little flare between the waterline and the deck edge. Flare and reserve buoyancy are controversial subjects. Our own experience is that if the hull is long enough, you create your reserve buoyancy, which you need for really big waves, with the waterline. Properly designed, that waterline puts buoyancy at the end of a long lever arm, so it works harder, at the same time it allows the hull to smoothly penetrate the wave. On the other hand, if there is too much volume in the bow, the wave has more to grab onto. We never said this was easy. The tank test photo above shows how a finer bow on a long boat can create as much or more buoyancy as the fat bow of a shorter boat. The advantage is that you can drive the fine bow through the wave, where the fat bow hits the wave like a breakwater – and stops (or pounds so hard you are forced to slow down because it is too hard on crew and structure). 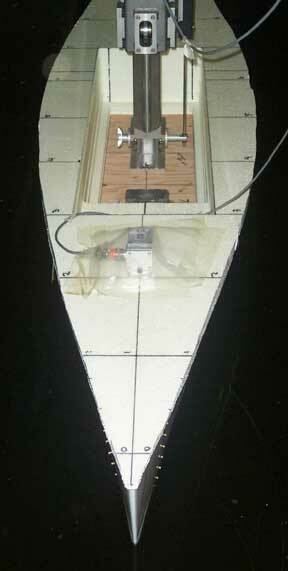 For this to work you need a long waterline and modest beam. 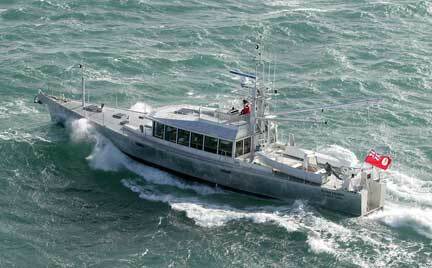 When you get it right, the boat will be able to maintain very high rates of comfortable speed into headseas. 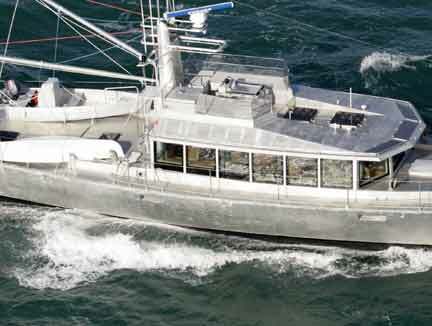 Now let’s take a look at the FPB 83 running at 12+ knots into 4- to 6-foot (1.2 to 1.8m) seas. These are steeper and about the same size as those shown in the first series of onboard photos at the beginning of this section. These first two images show the bow before it has encountered a wave. 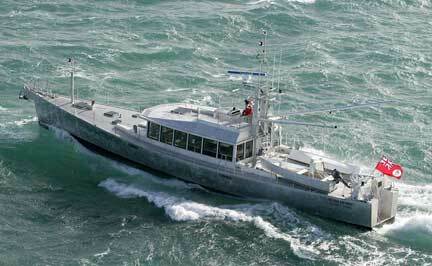 You can see in the close-up how small a bow wave the boat makes, even at 12 knots. Two seconds later and we’ve started to slice through a 4-foot (1.2m) wave. Notice how cleanly the bow has penetrated, and how little spray this makes. 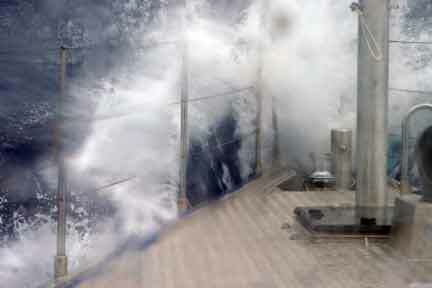 The wave is now well along the hull. Notice the change in pitch angle – almost none. We’re now deeply into the wave. In the final photo in this series, the bow is starting to emerge from the wave crest, still at a flat angle, ready to take on the next wave. So far we’ve discussed just the forward sections. But as the wave travels down the hull how it interacts with the boat is a function of the hull shape it encounters in the middle and stern (as well as forward). You will notice that this design has modest beam at the stern, much finer than what you are used to seeing on other motorboats or even our sailing designs. If the boat had a broad, buoyant stern, when the wave got to the back end it would lift this area, forcing the bow down and deep into the oncoming wave crest. This is what causes hobby-horsing and heavy slamming loads. To get a hull comfortably (and quickly) through head seas you need to look at the distribution of volume along the total length, not just in the bow. 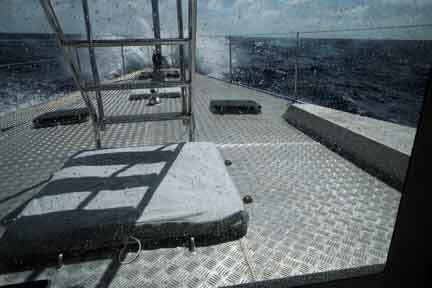 In the photo above the bow has just started to penetrate a wave while the preceding sea is just aft of amidships. Here is a close-up of the same photo. You can see a small amount of disturbance from the preceding crest even with the aft end of the house. A little less than two seconds later and the wave has now made its way to the stern. 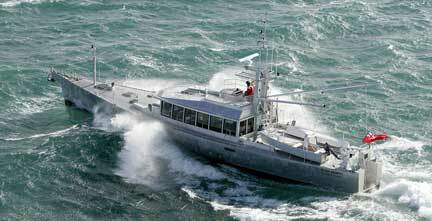 In both situations – when it is amidships and when it is at the stern – there is almost no vertical displacement of the hull. 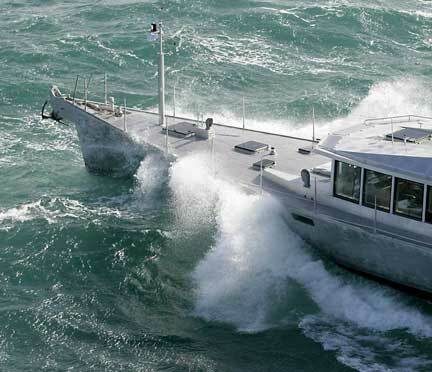 This reduces motion on the boat (and its occupants) and allows the bow to deal only with the next wave crest without being forced down into the oncoming trough by a stern which has been lifted by the previous wave. The fact that we averaged 11 knots through the water between Fiji and California, and made a difficult upwind passage from Honolulu to Ventura in nine days and seven hours, is the best indicator of how well this approach works in the real world. 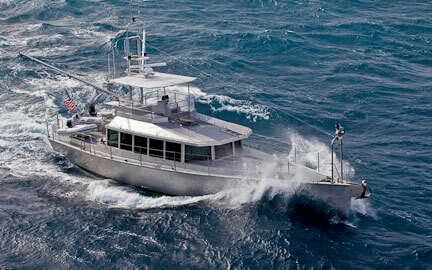 For a spectacular series of photos of the FPB 64 during a stormy sea trial click here. 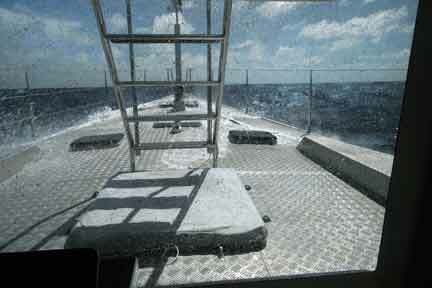 We’ve got some uphill video on a passage between the Bahamas and Nova Scotia here. This entry was posted on Friday, October 14th, 2011 at 3:33 pm and is filed under Dashew Offshore, Design Objectives. Both comments and pings are currently closed. Steve, I’m very interested in your books, your site and your boat designs, especially the FPB designs (personally discovered in that order!). I wonder if you have any comment on the shape of bow for 2011 Transat winner (David Raison’s ‘Teamwork Evolution’) i.e. 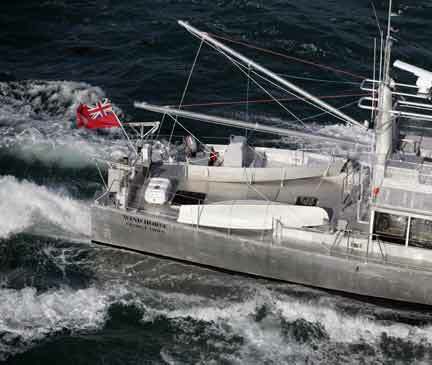 the “scow-bow” boat; also the X-Bow design from Ulstein for heavy weather offshore ships? Am not familiar with scow bows in the ocean, and they could work well off the wind. But upwind, ugh, you would need to be very tough and sail at high angles of heel. The X bow is OK as long as you are not running in big waves where it will bite and create steering difficulties, which has proven to be the case. But for jogging slowly into the sea, as you would do if you are servicing oil platforms in the North Sea, it cannot be beaten.